We decided this school holidays to do a big trip to Thailand and decided to stay at Graceland, although we were disappointed we didn’t see Elvis the kids club, Carpe Diam team of Tarisa, Miaden, Marko and Ana made the trip. Activities and well planned events made our boys feel like they were at home. Thanks guys this was a trip our boys will talk about for some time. Location is perfect. Short drive to centre of Patong but far enough away from the craziness and that the beach out front never over crowded. View from Grace bar and grill each night was beautiful-sunsets over the ocean!! Staff here so friendly-special shout out to Sapol. Hotel bigger than we expected with a lot of people staying. We were always able to find a quiet spot near the pools away from the main pool and hotel staff very helpful moving day beds. We found the staff so friendly and helpful at all times, from the room staff, security, bar staff, front desk and entertainment crew. Our room overlooked the foyer side/ taxi stop car park? We were on the forth floor so noise was not an issue and felt like we had our own quiet little corner but close to the foyer for pick up and if walking to local restaurants. Not sure how people can knock the buffet breakfast, it was amazing and choices were endless. It was very busy later in the morning but staff were very quick to clear tables and top up food choices. We made use of the bowling alley which was a good laugh. Foyer bar was good for a coffee or drink before heading out. This is a large busy hotel but we would definitely stay again. Fourth visit to Thailand, 1st with a child. Decided to stay at Graceland as its often recommended and thought good option as a family. Staying in pool access in the renovated sunset wing. To be honest not overly impressed. Room has a "damp" smell, mirror in room constantly foggy. Staying in building close to beach but band playing at hotel restaurant at the front is so loud every night until midnight its impossible to sleep. Pool is very busy with large groups, private pool area oftwn has children jumping in and out, people leaving cups, towels there. Rooms not sound proof so our baby often gets woken up. No steps in and out of pool and steep slippery curve makes it difficult to get in and out impossible if you have any mobility issues. Asked yesterday to move rooms due to noise and can move rooms today but only at 3pm, so a whole day wasted as we had planned a day out and a babysitter to stay with our son. Cant move earlier or later so this will also mean he wont get an afternoon sleep so qill be feral all day. Check in staff not welcoming or friendly. Kids club staff are great but the actual kids club definitely needs a revamp. Actual room is fine nice bathroom, comfortable bed, spacious. But overall disappointed in the resort, not sure what all the hype is about and wouldnt choose to stay here again. I came to this hotel from 3rd until 12th April, the location is great as your right across the road from patong beach, so if you get bored at the pool you can just pop over to the beach for a bit, morning walks on the beach are also great. Bangla road is a 10 minute walk too, but there are a lot of shops restaurants and street food stalls right next to the hotel and all the way down to Bangla road. There are a lot of pools at this hotel, and I was always able to find a sunbed although some days are much busier than others. There is a gym that runs classes all day and stuff for the kids to do. The food is very nice at the hotel, they do international food menu by the pool all day which isn’t too expensive. Breakfast is also nice and they do nice coffee. The main restaurant is manic so we ate in the sunset restaurant which has exactly the same food but just calmer. I did try the evening food which is very pricey but also very nice. The one thing I did like about the hotel is that they don’t mind you nipping accross the road a getting food from the street stalls and eating it at the pool. You can get yummy Thai food, for 80 baht which is filling and a lot cheaper. The rooms were very clean and comfortable it was cleaned every day and towels changed, room service was also good but pricey. I really enjoyed my stay here and would definitely stay again. I came here 4 years ago and stayed in the main wing and was disappointed. I came again and thinking the newer wing would be amazing I was again disappointed. We checked in late on a Monday night. Wasn't greeted with a refreshing drink, I had to ask for one. I had booked x 2 sunset grand deluxe rooms. They were disgusting. Definitely not worth the extra money. They were dirty, had to wear thongs in the room as the floor was filthy. Shower full of mould. Glass on doors dirty. My dad's rooms tv didn't work and his adapter exploded in his hand while charging his phone. I asked for a downgrade the next morning to a new room. Was much nicer. But come on, this is no 4 or 5 star resort let's get this clear. Even with the newer cleaner rooms this is a 3 star hotel at it's best!!! Service is 2 star, location 4 star, rooms 3 star, pools and surroundings 2 to 3 star. The pools were clean but the rest of the areas were run down. So old and stale. Felt like I was in the 80s. I will not be coming to this hotel again nor will I come to patong. The place has changed due to the tourism. Place has become sleazy, ppl are rude. Such a shame cause Thai people are known to be such beautiful people. My wife and I spent 10 nights here in a pool access room and thought it was a great base for our visit to Patong. The hotel is far enough from the the city centre for it be that little more quite and yet still close enough for it to be a short stroll to many restaurants and markets etc. The beach is conveniently just across the street and we where blessed with a selection of swimming pools in the resort. The room was adequate though there where some issues with the toilet! But overall we where happy and would return here if we came back to Patong again. I need to say that the staff where superb throughout and could not be faulted at all. Vishal at reception is an absolute gentleman and an asset to the resort. Highly recommended. PROS: -Beautiful resort & very large; got lost twice on my first day -Many pools with great upkeep, there are many lounge chairs so it never feels crowded, we loved having the option to go to shaded areas so our toddlers were not in the sun all day, but could still swim, I LOVED the cabanas and the large grass area where the kids could run around -Our room was a good size, the glass shower was tastefully designed, our toddlers spent many hours in the balcony/porch area, the desk, bench, & lounge chaise were very useful for us -We booked a pool view room & the balcony/porch area had a gate with a path leading to the pool & the opposite way led across the street to the beach -Even though it was filled with many people, noise was never an issue -Beach is right across the street as well as many street foods -Very short walk to stores, 15-20 minute walk to Bangla road & Jungceylon Mall -Fitness Center was satisfactory as far as equipment, it was clean, & attendants were very friendly & helpful -Souvenir shop had many great items to offer at fair prices -Beautiful restaurant overlooking the beach with live music at night, the lady sounds absolutely amazing, it would be ideal for a romantic dinner -The staff that walks around dressed up & marketing for the Kids Club are great & very friendly, our kids loved them CONS: -Could use better upkeep, very apparent & quick patch up jobs throughout -The View Bar & The Flavor Bar were both under renovation & closed which wasn't mentioned on the website, we were looking forward to doing a recommended date night at both -Very large, visible amount of mold on the shower window covering when we first checked in (we were going to move rooms but staff said they would change it in the morning; the new room I was offered for a possible move was in a much dated condition so we decided to wait for the coverings in our original room to be changed, which did not happen in the given time frame so we had to ask the housekeeper that came to clean our room & she was able to get it done within two hours-she was very kind & understanding) the mold was very obvious so it was a huge overlook on the resort's behalf as well as the trash in our room that was not emptied prior to us checking in. -We purchased the breakfast buffet which was overall great, however, the restaurant dinnerware was pure horror. I would say 1/5 of plates we picked up were still dirty with left over food, 3 out of 4 utensils were dirty--one day a USED fork with ketchup or other red sauce was placed at our table while being set, & 9 out of 10 glasses still had lip marks/smudges from not being washed thoroughly. You really had to inspect all of the silverware/tableware as it was most likely to be washed incorrectly & unhygienic. A large resort to overlook minor things is reasonable, but to have this many badly un-inspected items dealing with food & safety is unacceptable. -Our second time using the Kids Club (4/4/19 around 11am/12pm) so that we could use the fitness center for 30 minutes, a staff member rudely questioned our child's age (children have to be a certain age to be left a kid's club for free, she was insinuating we were lying). I told her his age, but kept asking if I were sure, again very rudely. I will have to admit that I answered rudely back because I was taken aback by how she was acting, I told her that he may not be as big as others, but I know my son's age & if she really wanted to verify she could do so by calling the front office as they photocopied all of our passports & the attendant calculated our kids' ages upon check in. She got an attitude & got on the phone as we were leaving, I'm assuming to verify with the front desk. I later found out that she QUESTIONED my children of their ages as well which to me at that point was inappropriate as it was not serving any other helpful purpose. If she was that concerned she could have just put a smile on her face, greeted us appropriately & called the front desk instead of making the entire situation awkward & we could have avoided such a deplorable encounter with someone whom we are trusting to care for our children. Needless to say, we rushed through our workout to get to our children & would not have used their services that day if she was the only attendant because we were so uncomfortable with her at that point. I thanked her as we picked up our kids but she barely acknowledged us & did not offer an apology for her behavior. Would book here again, but I would inspect the room upon check in & skip out on breakfast buffet as well as avoid the Kids Club if the rude lady (mentioned above) is working. Phuket Graceland Resort And Spa places you next to Patong Beach and within a mile (2 km) of other popular attractions like Jungceylon Shopping Center. This 600-room, 4.5-star resort welcomes guests with 3 outdoor pools, 5 restaurants, and free in-room WiFi. Relish the Belgian cuisine at Belgian Beer Cafe, one of 5 onsite restaurants. Savor a meal from the comfort of your room with 24-hour room service, or get a quick energy boost at the coffee shop/café. For your convenience, a buffet breakfast is served for a fee each morning from 6 AM to 10:30 AM. Guests can expect to find free WiFi and 42-inch an LCD TV with satellite channels. The bathroom offers hair dryers, free toiletries, bathrobes, and slippers. Other standard amenities include a refrigerator, a minibar, and a coffee maker. 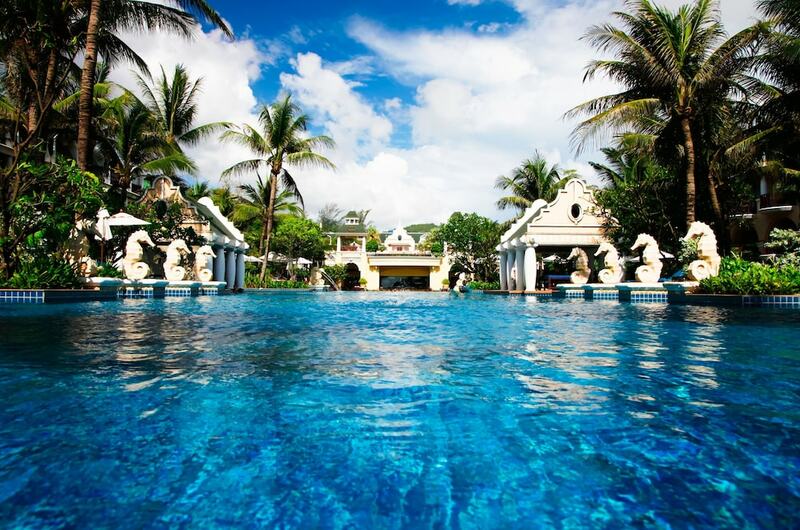 Guests of Phuket Graceland Resort And Spa enjoy 3 outdoor pools, a children's pool, and a fitness center. You can take advantage of free parking, along with an airport shuttle (available 24 hours) for THB 1000 per vehicle one-way. Multilingual staff at the 24-hour front desk can assist with dry cleaning/laundry, tours or tickets, and luggage storage. Other amenities at this beach resort include a spa tub, a sauna, and conference space. Buffet breakfast is served daily from 6 AM to 10:30 AM for a fee. Belgian Beer Cafe - Ocean-view restaurant and bar specializing in Belgian cuisine. Open daily for lunch and dinner. Kid's menu available. The Flavor - Restaurant specializing in Thai cuisine. Open daily for dinner. Sunset Restaurant - Restaurant open daily for breakfast. The View Bar - Bar open daily for dinner. The preferred airport is Phuket (HKT-Phuket Intl. ): 31-min drive, 20.9 mi/33.6 km. This property charges a general deposit per room booked at check-in. For more details, please contact the property using the information on the reservation confirmation received after booking.